Triangle Hot Tub - The Perfect Solution For Small Spaces! What is a triangle spa / corner hot tub? If you are reading this, you will already know that relaxing in a triangle hot tub is the perfect way to unwind after a long day at work. However, many homes today simply don’t have the space for a large spa. Lack of a large dedicated space is no reason to live without a hot tub. In fact, triangle spas (otherwise known as a triangle hot tub) are designed especially for small spaces, and if you are looking for a hot tub solution, then one of these may well suit your needs. 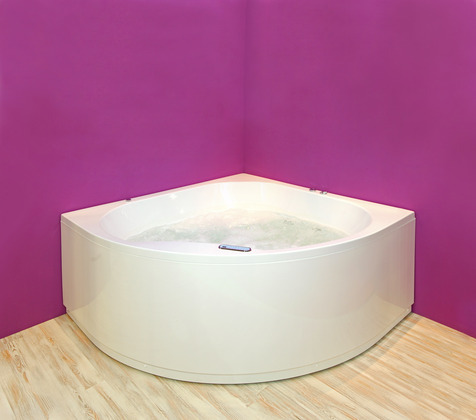 A triangle spa is a corner hot tub shaped specifically to fit into a corner. Because it doesn’t take up a lot of space, nearly anyone can own one. In general, they are smaller hot tubs, usually designed for two to three people to use comfortably but people who have more available space can also purchase a triangle-shaped spa for their home. People who choose these corner soaking tubs as opposed to larger ones don’t have to compromise on features. Triangle spas are just as relaxing as the larger models and can be customized with the ideal number of jets. Three of the best affordable corner spas on the market today are made by American Spas and QCA Spas. It’s important to not expect all the features of high-end hot tubs when you invest in one of these models. They are designed to allow people on a budget to have a triangle hot tub in their home and therefore lack a lot of the features spas in the $5,000 to $10,000 range will have – but that doesn’t mean they lack quality and style, as you will find out by reading about them in the sections below. If you’re looking for an affordable spa that doesn’t require a lot of technical expertise to set up, this might be the best spa for you. The smooth shell makes this particular spa, although it is at the low end of the spa price range, look and feel like a high-end hot tub. While the price of the hot tub is affordable at just $3,200, its ‘green’ operation will also help you save money on your energy bills. Instead of using additional energy to heat the water, this spa uses the heat generated by the motor and pump to keep the water nice and warm. The 12 jets are placed strategically, so even though there aren’t as many as some other hot tubs at this price point, they provide effective hydrotherapy to sooth away all the stress of the day. It’s always important to cover your hot tub with a rigid cover. This keeps curious neighborhood children, pets and wildlife out of the spa and ensures the water stays warm without running the motor. This spa comes with a cover but it might not be effective at achieving both the purpose of keeping unwanted people and animal out and the heated air inside. If you’re in need of a triangle hot tub but don’t have a lot of money to spend, this is a great choice. Be sure to purchase a cover separately to protect your investment. For a hot tub with 28 jets and adjustable settings for each of the two seats, this spa offers a nice comfortable experience for only about $3,700. Because it is smaller and designed to comfortably seat two people, couples can relax in their hot tub without paying to heat a large area that no one is using. The shell is constructed of reinforced laminate Fiber steel and protected from the elements with a layer of energy saving insulation. This spa keeps the water clean through natural processes such as active ozone bubbles and the Bio-Clean filter so you won’t need to rely on as many chemical to keep the water sparkling and sanitized. A high-quality cover that will protect the spa from unwanted guests and also conserve energy by keeping the warm water inside is included with this hot tub. This triangle hot tub has a beautiful design that will go perfectly with any wood deck. The Tuscany Sun and Mahogany colors make this spa unique and also increase the price slightly. The LED lights offer a cool effect and may make relaxing in the spa at night a little more interesting. One drawback of buying a spa in this price range is that the power isn’t as strong as higher-end models but it is certainly sufficient for the average family. If you want more than a basic hot tub and the idea of being able to control all of the jets appeals to you, this may be the right choice for your family. This 28 jet spa allows users to adjust each of the sprays for their personal comfort. At only $3,620, you can save some money by bypassing the unique colors for a basic sterling silver colored hot tub. Most homeowners can install this spa on their own and start using it as soon as the water is hot enough. The outer layer is sleek and smooth, unlike some other hot tubs in this price range, with bumpy, pebble-like textures. Couples who want a spa without all the aesthetic features should be very happy with this hot tub. The hydrotherapy is comforting and is sufficient to ease tired muscles. Although three people could fit in this triangle hot tub, it is more comfortable when only two are in it. Couples who need different degrees of pressure from the jets can easily adjust their side of the spa. This model also features the LED lights that add a nice effect to an otherwise ordinary hot tub. This model is ideal for a couple who doesn’t have $10,000 to invest in a high-end home spa and only need a basic model that will serve its purpose. Having a hot tub on the patio is a convenience nearly anyone can afford. By choosing one of these affordable models, you can get the basic features that you want without all the frills that make high-end spas so expensive. When you merely need a place to relax with your partner after a long day at work, consider purchasing one of these great triangle spas. They are perfect for people who think they don’t have enough money or enough space for a hot tub in their lives. HydroClear Ozonator purifies water using active ozone bubbles from a Corona Discharge cell, which keeps your water clear, sanitized, and clean - eliminating much of the routine maintenance.